Stonehenge — the Giant’s Dance — powerful energy center, astronomically significant, this Temple was ancient even to the Celts, dating back to a far earlier civilization, the shadowy megalithic (or ‘great stone’) culture of the second and third millennia BC. 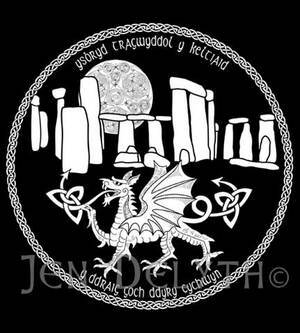 The legend goes that Myrddin (Merlin) mythically built Stonehenge by himself, in one night, calling all its massive stones from Ireland with his magic songs. He saw that there was a mystic pool containing a white and a red dragon fighting beneath the stones. The dragons symbolize the natural energies of the earth which polarize into positive and negative roles. Stonehenge is built upon a powerful convergence of these geomantic forces—ley lines —the Chinese call them Dragon Currents — which connect the whole earth by a complicated network of energy flow. The Red Dragon of Wales is derived from the Great Red Serpent (the Earth Serpent) that once represented the old Welsh god Dewi. Y ddraig goch ddyry cychwyn! - Rough translation “The Red Dragon will rise again!